There was a time when even those "big guys" were perfectly unknown. Now, time has come to introduce you Trasvelox, a small new HiFi manufacturer located in Como, in the North of Italy. Actually, the name of the Company is D.L. Audio and Trasvelox is the name of their loudspeakers line. D.L. Audio, besides making loudspeakers, restores and sells vintage tube radios. The Trasvelox line includes three models: two standmounting and one floorstander. The sample that has arrived at the palatial TNT-Audio headquarters is the smaller one, the Freewind 12. Here "12" stands for the litres of internal volume of the cabinet. You can tell these speakers come from Italy by just looking at them: a solid walnut cabinet and a luxurious finish that can't be mistaken. The man behind these speakers is Luca Drago, who devoted 2 years of research to develop the Freewind series. The Trasvelox Freewind 12 is a conventional 2-way, rear firing bass reflex enclosure with a couple of quite interesting features. First of all, the front baffle has a slope to align the acoustic phase of the drivers (nothing new under the Sun, after all). Secondly, the speaker uses a so-called environmental correction control (in Italian: C.R.A. Controllo Riflessioni Ambientali) that should make room acoustics interface less critical. In other words, there's a switch in the rear, near the binding posts, that can decrease the amount of mid-high frequencies delivered by the loudspeaker. Simply put, the switch inserts a cap on the tweeter section of the crossover network. The possibility to modify the amount of mid-high frequencies should help when installing the loudspeaker into highly reflecting rooms (a kind of rudimental tone control - without resistors!). The Freewind 12 uses a 34 mm Audax tweeter (a very popular driver among die-hard DIYers) and a 16 cm (6") Ciare woofer. The crossover network makes use of high quality passive parts: MKT caps and air-winded coils while internal wiring is done by means of conveniently sized Prospecta cables. The quality of the finish is very high and can rival with the best Italian competitors. Not easy for an absolute beginner. The Trasvelox Freewind 12 have been placed on 60 cm loudspeaker stands so to put the tweeter at the right listening quota. These loudspeakers have been listened into two different rooms with a quantity of amplifiers, starting with an output power as low as 10 watts. Anyway, considering the low sensitivity (85 dB/w/m) the manufacturer suggests to start from 20 watts per channel at least. The Freewind 12 immediately shows its personality: open and extremely defined in the mid-to-high range, a bit dry in the bass. Of course, this is mainly due to the quality and personality of the Audax tweeter but it is also clear that a cleverly designed crossover network and good quality passive components must have influenced the performance. This "openness" aids detecting the real content of many recordings though I wouldn't define this speaker as hyper-analitycal. Actually, the Freewind 12 is extremely Music friendly, in the sense that it lets you concentrate on Music and not on listening fatigue. The Freewind 12 has a brass badge in the rear where the manufacturer claims the speaker to be "True High Definition". At a first glance this apparent excess of self-praising can appear as just "too much hype"...but, as listening proceeds, you can't help but notice there's something true in it. This is not a loudspeaker for someone who loves warm and soft sounds. Rather, it has been designed having the definition of the sound as ultimate goal. For, the manufacturer claims he has tried to mimick the tonal balance and overall performance of a myth among audiophiles, the Stax Lambda Pro Classic headphones! Of course, this speaker doesn't sound exactly like a Stax Lambda but it still tries (and succeeds!) to deliver a large amount of sonic microinformations and to offer a very high level of transparency. More precisely, you get an excellent reproduction of human voices. Especially female ones appear to be very present and defined. For example, I'm referring to Giorgia's "Mangio Troppa Cioccolata" [BMG - 74321 508632 - 1997], one of the best new Italian singers of r'n'b and Pop Music. Giorgia, though being 100% Italian, has a voice with something "black" in it. With the Freewind 12 it appears only a bit "lighter" than usual, clearly the tonal balance of the speaker favours the upper octaves. The same happens to Kay Bianco, an extremely sensual singer of Italian R'n'B (Iside [Ricordi - New Planet - NMCD 1104 - 1999]). Again, the "black" note appears to be lighter than I'm used to. With male voices this weight-watchers-effect is more evident, though the precision and natural timbre lets you easily forget (and forgive) the rest. In particular, you may need more warmth and "body" with certain black voices such as Keb'mo, if you're a blues fan, or Notorius BIG (R.I.P. ), if you're an hip hop nut. As you can imagine, the extreme transparency plays a fundamental - and beneficial - role with string instruments that appear very realistic, metallic as they should be, though remaining natural and pleasant to the ear. The 16 cm woofer seems a good partner for the 34 mm Audax tweeter and there's nothing to complain about at the crossover frequency, no audible "step" or change of tonal balance. This usually happens with carefully designed crossover networks. Hence, the woofer follows the tweeter personality and appears clean, agile and free from any sort of boominess. A bit dry, indeed. The claimed -3dB point @ 45 Hz can be confirmed by ear quite easily. Despite this good extension (considering the size of the loudspeaker) the level of articulation of the bass range remains high. No, it is not a bass range designed to impress for punch and impact. It favours control and articulation instead of sheer violence and presence. Actually, it lacks the kick which is needed with many musical genres but one can't have it all. If you consider the relatively small size of the cabinet and the cost of the loudspeaker...you should be ready for a compromise. Instead of complaining about the lack of "brutal" bass I should praise the designer for his ability to keep the overall tonal balance as coherent as possible. In any case, you can't hope to get more bass just cranking the volume up. I know this happens quite often with low sensitivity speakers! The overall balance modifies with the listening level: more volume, more bass. Not so with the Freewind 12: more volume means just more volume and if you force the speaker a bit [Massive Attack, Heat Miser in "Protection" WBRCD2 1994] you can easily get an excess of brightness from the tweeter, instead. So, do not attempt to make these speakers sound as they shouldn't. The sonic imprint the designer gave to them won't allow you to get something different than an open, crystal clear and transparent sound. As said, the coherence of the speaker is remarkable. Only with some excessively bright recording the tweeter tends to "mask" the woofer. This speaker is of the low-sensitivity kind, being capable of just 85 dB/w/m. This means that - unless your listening room is very small - you may need a quite powerful amplifier to get realistic sound pressure levels. In small rooms (10 sqm or so) even a low powered amp would suffice as I've got a good result with 10 watts or so. In the macrodynamics department the speaker performs quite nicely but - clearly - it is NOT the area where it performs best. It is very good at reproducing tiny details and microvariations, instead. The ability to unveil tiny details of your recordings is stunning even regardless of the list price. So, you won't jump on the armchair because of floor-shaking dynamics...rather, you will remain glued to your listening seat thanks to the ability of the speaker to bring you closer to Music and its nuances. With musical programs that require high dynamics you will be enjoying hidden details of the recording instead, details that could be easily lost with more aggressive and punchy loudspeakers. Somehow, this Trasvelox Freewind 12 reminds me some planar loudspeaker that can't rival with the best conventional dynamic loudspeakers in terms of punch and impact but still can be extremely enjoyable because of the large amount of musical informations it delivers. "Mentally" involving, even if NOT "physically" involving. For example, attacks of the kickdrum and "slaps" of bass guitar strings lack that verve and energy which are sometimes necessary. From time to time you feel the speaker is too "in control". This is the price to pay for a clean, polite and "controlled" performance. Timing is quite good though sometimes I've felt the tweeter a bit "faster" than the woofer, both during attacks and decays. Being so transparent, this speaker couldn't perform bad at 3D soundstaging. Indeed, the virtual stage is extremely wide and nicely focused, as one could expect. From time to time cymbals and voices appear definitely in front of the rest, aligned in a sort of "first row" that can result natural with certain recordings and excessive with others. On the other hand, cymbals will sound "into" the tweeters only with poor recordings. The good focus on singers and players helps distinguishing different areas of the stage, side to side, back and forth. The depth of the stage isn't excellent (I somehow expected this) but I'd rather consider it adequate to the class of the speaker and perfectly aligned with the general behaviour of the sonic performance. You should already know that speakers that deliver extremely deep soundstage often lack presence in the mid range. Of course, there are speakers that can do both things equally well (well defined midrange and deep stage) but they cost N-times the price of this Freewind 12. If you fancy, you can try placing the speaker on spikes. Perhaps this could boost the already cited good performances in terms of focus and stability of the image. I've preferred placing them on the supplied felt disks, for a more balanced performance, especially with the spiked speaker stands I've used. Usual disclaimers apply: break-in, good speakers stands and careful room placement. You should try to balance the weight of the bass range with the depth of the soundstage. I've found this speaker quite easy to install and room friendly: it sounds acceptably well even when placed casually in the listening room. Depending on room geometry and personal tastes, you can try different amounts of "toe-in", even extreme ones :-) The Audax tweeter polar response and large radiating area allows good performances even when listened largely off-axis. Amplifiers: as said, the low sensitivity forces you to use powerful amplifiers. Only in very small rooms you can go below 20 watts per channel. In any case, power isn't everything: 50 GOOD watts should be more than enough even in large rooms, considering this speaker hasn't been designed to deliver high sound pressure levels or to fill extremely large dynamic gaps. If you're thinking to use them into a Home Theater environment (shame on you :-)) keep 'em far from the TV set as the drivers are not of the shielded kind. The quality of the finish, as already remarked, is extremely good. It seems the manufacturer has taken care of every detail and this is surprising if you consider Trasvelox is a very young Company. The 8-shaped dust grids are a nice touch of class that blends perfectly with the looks of the speaker. The binding posts look cool but are a pain in the neck to use. I'd love to see loudspeaker manufacturers using conveniently SPACED posts....we don' have pliers in lieu of hands and fingers. The brass annulus of the woofers looks cool but is a pain in the neck to keep clean and polished. Be prepared to polish these every now and then (quite often, actually). Each speaker is equipped with 4 felt disks that act as unique interface with the speaker stand. There are no drilled holes for adjustable spikes. Well, let me put this straight: the C.R.A. switch in the rear panel seemed completely useless to me. While I've listened to these speakers in two different rooms I've always kept the level of the mid-high range at its lowest setting. I can't figure out which kind of listening room may require the highest setting. Anyway, it is nice to know that you can adjust the level of the mid-high range. 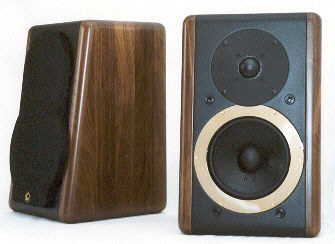 Finally, a remark on cost: 1,100 Euro (pair) may appear a bit steep, considering these speakers are sold factory direct. But, once you see the quality of the manufacturing and enjoy the overall performance of the speaker you can consider it mostly adequate. Of course, considering these speakers are available (till now) only at the manufacturer's plants in Como it is hard to predict a vast sales success. I'd like to remind you that buying without personal listening, basing your decision only on good reviews, is ALWAYS A BIG MISTAKE. The Trasvelox Freewind 12 has been a nice surprise. In the past we have had not 100% satisfing results with absolute beginners (see our reviews of Diesis and Ultrasound, just to name two Italian brands) so I was somehow concerned. Unexpectedly, these speakers proved to be a mature product, able to rival with well established competitors in their price range. They are not revolutionary, but do offer something "personal" both in terms of sonic performance and looks. Let me also add a comment on the designer/manufacturer. It is not unusual to meet young designers who think to have discovered the Only (Holy) Way to design a loudspeaker. It seems they have seen the Light and received a Mission by the Powers That Be. Not so Trasvelox. They have started with a low-key approach (1 series of 3 loudspeakers) and an extremely serious and honest attitude. The three speakers in the Freewind range share the same looks and personality, being equipped with the very same tweeter. Also, these 3 models do exist, they can be tested and bought. Does this seem obvious? It doesn't, trust me.